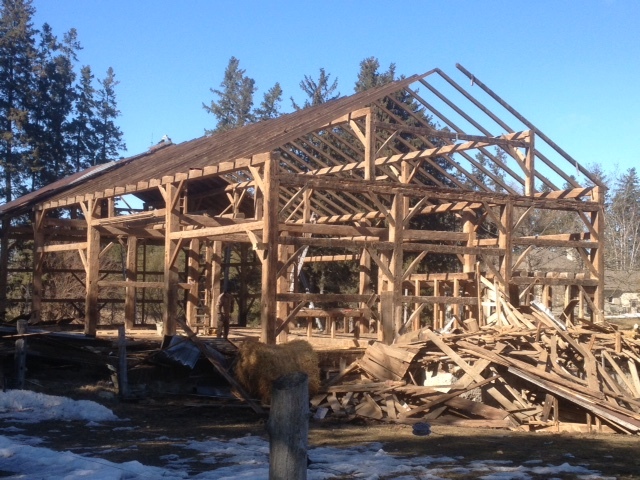 The reasons century old barns are taken down vary, sometimes the land owner needs to repurpose the site for another kind of structure, depending on what the land is being used for presently. Often barns that were built over a hundred years ago were definitely built to last but over the years especially ones that are left empty and unused for many years can deteriorate and become dangerous and unsafe, and these structures are not able to be saved and need to come down before someone is hurt or injured. Recently Shane and his crew took down a barn that was built around the 1870’s but this barn is not being just taken down it was meticulously tagged and logged so that the structure can be loaded onto trailers and be shipped to Waco, Texas. Upon arrival it will be laid out and the process of reassembly will begin, each log will be put back together somewhat like a puzzle and this particular structure will then be used as someone’s home. What a wonderful journey for a structure built hundreds of years ago to not meet its end but continue its journey and become a family home. S & J Barn Demolition not only repurposed century old wooden structures but they also use them to repair parts of a building that may have rotted away over the years can be taken out and replaced making it again useful and strong.